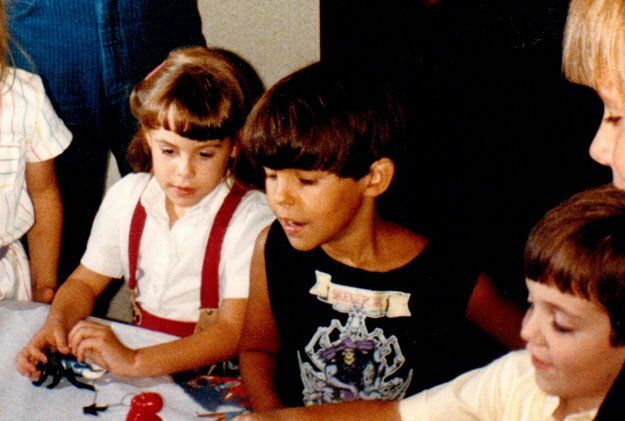 My wardrobe consisted of a bunch of crap I hated wearing... and my He-Man shirts. Check out my sweet Justin Beiber hair! And I like that you can spot a Sectaurs toy in one of those shots too. I had forgotten until I saw this pic that Clawful was one of my favorites as a child. That grasping claw feature was endless fun. 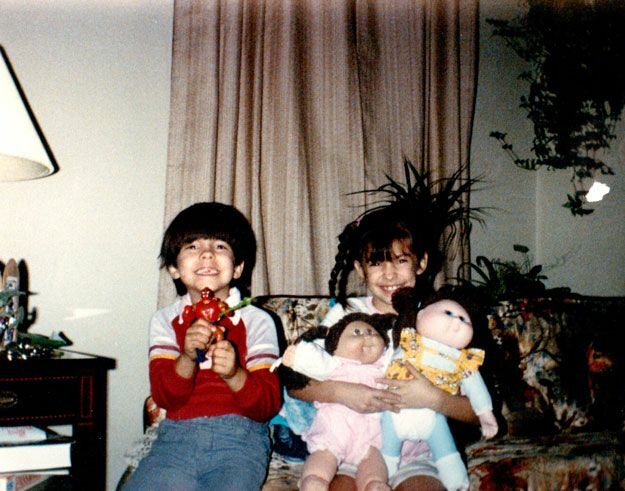 My sister is seen here with her first Cabbage Patch Doll (named Brandy if I remember right), and some knock-off pretender Cabbage Patch doll that I don't even remember her owning. I'm sure that one got sent to the closet shortly after she got the real deal. My 6th birthday party. 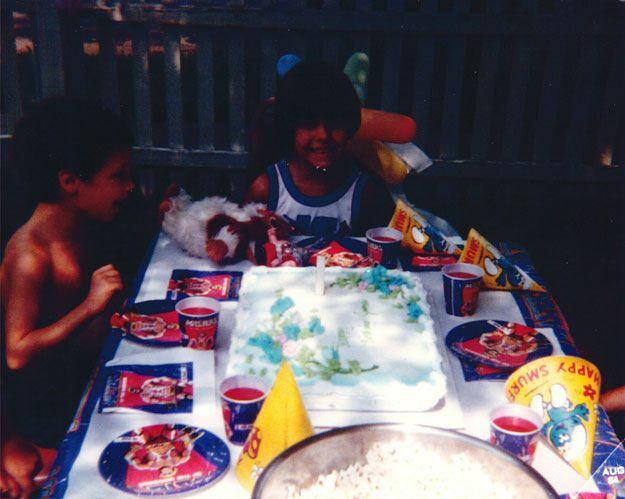 Also my only childhood birthday party. 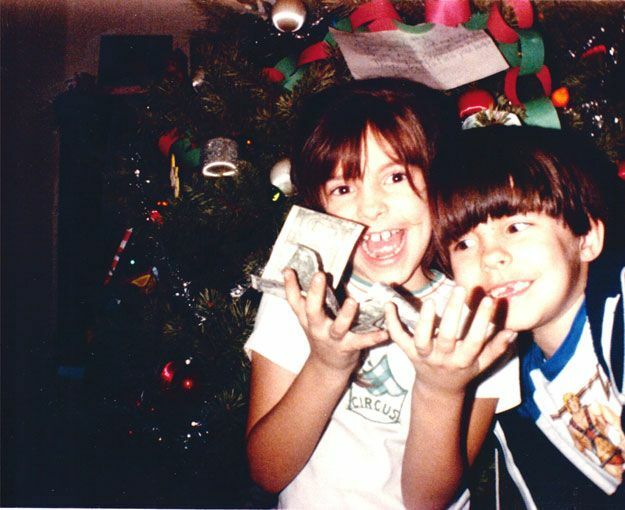 We had a choice as kids: Party or more presents. I almost always chose the latter, but on my 6th birthday I picked party over extra presents. The table was decked out in He-Man stuff, and my newly acquired Ram-Man rests right in front of me. Also in front of me is another present I got that year that would go on to become my favorite childhood toy- Gizmo. He went everywhere with me for the next few years, becoming (though it may sound strange) one of my closest childhood friends. Gizmo (though his fur is old, the paint on his eyes is almost totally worn off, and he long ago lost his ability to squeak) now resides with the rest of my 2 sons' stuffed animals, as he deserves to keep getting playtime for the years of enjoyment he gave me. Oh... and you may notice the lack of MOTU presence on the cake. That's because we had a separate cake for the party. The He-Man cake was reserved for the family birthday celebration. 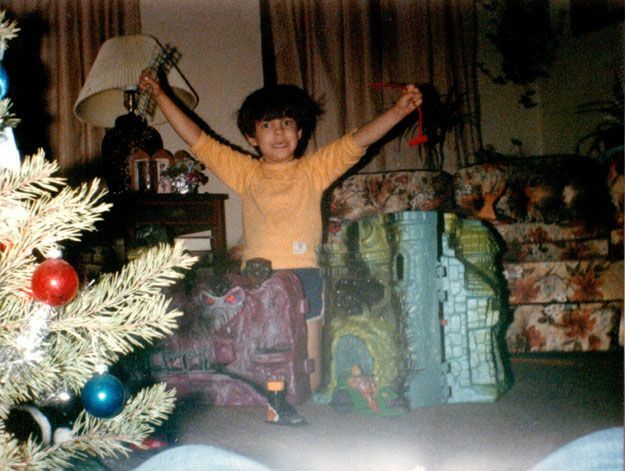 Lastly, one of the greatest Christmas days ever- The year "Santa" brought Snake Mountain home to join Castle Grayskull. I apparently also got Road Ripper that same year, as evidenced by me maniacally clutching the zip-strip in my hand. Funny story- My mom used to have all the presents wrapped under the tree a short time before Christmas. To keep us from taking peeks or shaking the boxes, she would tell us that they were just empty boxes waiting for Santa to come fill them. Santa would know if we touched any of them, and would leave those that had been touched empty so that she would know on Christmas if we had touched any. Sneaky moms. Nice post James! All that He-man stuff really takes me back; I got my Snake Mountan, Greyskull for Christmas too, and I think ram-man may have been a bday gift...and I think we had the same couch as well. Very Weird lol.